Today, I went to BestBuy with my 15 year old daughter to look for a digital camcorder. She wanted something that did HD and we found an interesting model for $149. I suggested that we go back home and read some customer reviews before buying it (plus, she had neglected to bring her money). She did her research and in doing so, discovered that the camcorder was on sale for $99 on BestBuy’s website. I looked at the offer on the website to make sure it wasn’t a “web only” deal. It wasn’t. She started to order it online for in-store pickup but noticed that a photo id for the credit card holder would be required. She doesn’t have an id yet, so we jumped in the car and headed to the store. At checkout, the camcorder rang up at $149. My daughter, who doesn’t like confrontation and doesn’t yet earn her own living, was more than happy to pay $149, but I was not. Moreover, as a 23 year veteran of the Consumer Electronics industry and someone who was familiar with BestBuy’s issue a while back regarding web/in-store pricing, I wanted to be sure that they honored the online price. I told the cashier that it was $99 on the website. He started to point me to a makeshift kiosk that had been set up to allow customers to do on-line price checks, but then actually walked over to it himself and looked up the item on BestBuy’s website. Sure enough it was still $99. He did a price override and we completed the transaction. BestBuy has received lots of praise for their innovative use of social media, both internally and externally. As someone keenly interested in retailers’ use of social media, I naturally follow them on Twitter. I am also very much a Customer Experience aficionado, so when I got home, I started an exchange on Twitter with Best Buy’s Chief Marketing Officer, Barry Judge. As you can see, Mr. Judge’s first reply challenged the idea that prices should be the same. Now without taking a big detour into the intricacies of multi-channel pricing strategies, I’ll say that there are absolutely situations where prices can and should differ. Between physical markets (and sometimes stores in the same market) prices can vary based on the competitive environment. Between online and in-store for a chain like BestBuy, it gets a little more complicated. They have to compete with on-line pure plays (e.g. Amazon), but not cannibalize their physical stores, especially if their strategy is to have the two channels compliment each other. In this case, given that it was not a web-exclusive offer and their own price guarantee says they will match BestBuy.com, I replied that they prices should be the same. Otherwise, it can only lead to a bad customer experience like the frustration of finding that you should have received a lower price and having to drive back to the store for a refund. I made a few other comments including pointing out that the cashier handled the situation well. 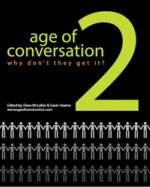 When I suggested that customers don’t care about the different “value propositions” that Mr. Judge had cited earlier; that what matters to the customer is the experience they have, the “tone” of the conversation shifted dramatically. When I told him that I was well versed in multi-channel retail complexities, I was shocked by his reply. Not wanting to assume a meaning, I asked him to clarify. At that point he abruptly ended the conversation. Of course, that didn’t end the conversation. I posted a link to the exchange on Twitter and asked for people’s opinions and the replies and retweets have been coming at a steady pace. It used to be that if you shared a bad experience, 100 people would hear about it. In the world of social media, those numbers can increase exponentially (ask United Airlines). 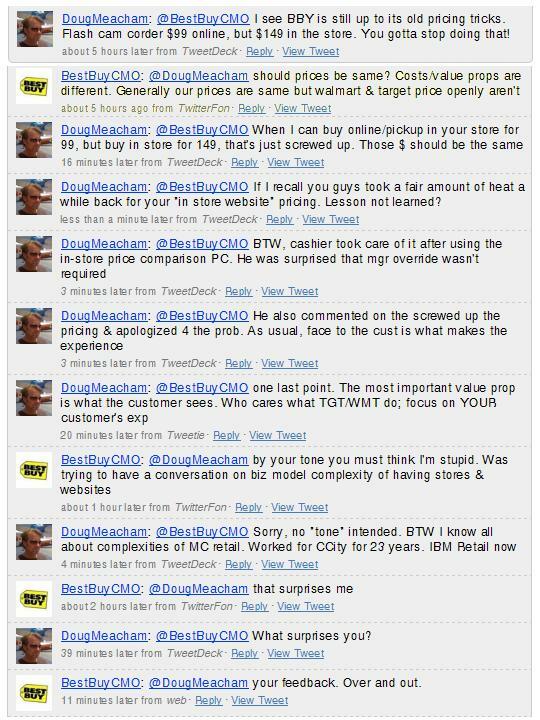 With that being one of the fundamental facts for companies to understand about social media, I was really surprised that the Chief Marketing Officer for BestBuy would engage with a customer former customer in this way. What do you think? Was I being out of line? How could this conversation gone differently?